Enjoy a beautifully restored 1800's farmhouse and additions with private, affordable serviced ensuite apartments or Self Contained accommodation options located in the magnificent Derwent Valley Southern Tasmania. Why not have a break when travelling between Hobart and Strahan. We are only 10 minutes drive to Mount Field National Park and the magnificent Russell Falls or take a short 1/2 hour to New Norfolk, Maydena or Hamiton. Hobart is just 1 hour away. You know we are just 1 hour to the World Heritage South West Wilderness including Lake Pedder. Hamlet Downs has been voted by guests in the top 10 of the People's Choice awards. We are an accredited business under the National Tourism Accreditation Program with the Tourism Council Tasmania. The property features lovely gardens and a 1 km walking track along our waterway and around our ponds where you may see a wonderful array of birds and other wildlife. 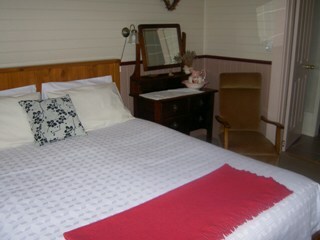 Stay at Hamlet Downs Country Accommodation and enjoy our peaceful idyllic surroundings. We offer light or cooked breakfasts but also offer the discerning traveller the complete dinner, bed and breakfast package. For guests wanting Self Contained, we can provide full breakfast provisions if required. All linen is provided. Interconnecting rooms available. Rate shown is for room only. Children are 4 to 14 years old inclusive. We also offer great breakfasts and a sumptuous dinner menu. 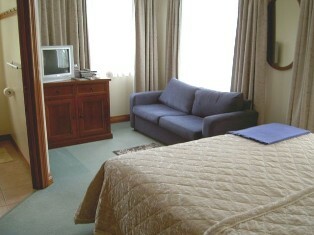 This lovely roomy facility has 2 bedrooms: 1 room with Queen bed and 1 room with 2 single beds. 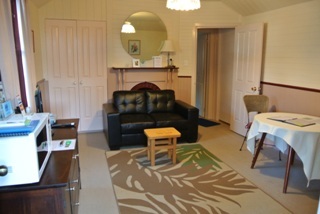 It also has a private bathroom, a full sized kitchen and a dining/lounge area with warm wood fire or electric heating. 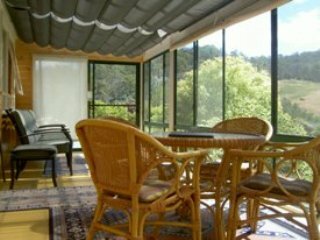 A verandah is also provided with lovely views to the garden. Rate shown is for room only. We also offer great breakfasts and a sumptuous dinner menu. 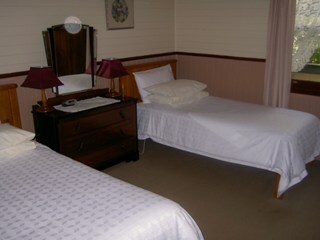 This lovely roomy facility has 2 bedrooms: 1 room with Queen bed and 1 room with 2 single beds. It also has a private bathroom, a full sized kitchen and a dining/lounge area with wood fire. 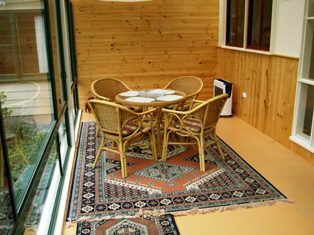 A verandah is also provided with lovely views to the garden. Rate shown is for 1 or 2 persons, room only. A lovely sunny room with its own entrance, King sized bed (or 2 singles-please specify in the Requests area if you require single beds)and an ensuite bathroom with 3/4 bath. Want views? How about your own sunroom/dining area exclusive to this unit with great vistas to our ponds and gardens. It also has a kitchenette with hotplates, small pizza/grill/baking oven, a microwave, toaster and kettle. Essential cooking utensils, linen and crockery/cutlery are provided. Why cook when we also offer great breakfasts and a sumptuous and extensive dinner menu with dishes for all tastes featuring our own seasonal vegetables and fruit. Rate shown is for 2 persons in a bedroom enjoying a 2 course dinner (main course plus entree or dessert) from our extensive a la carte menu, and full breakfasts incl. cooked items. Please order dinner on arrival. More than 2 people? The additional rate, is $89/person/night payable on arrival. Please show in the guest comments field how many persons there will be if more than 2 (max 4 persons in the unit). This lovely roomy facility has 2 bedrooms: 1 room with Queen bed and 1 room with 2 single beds. 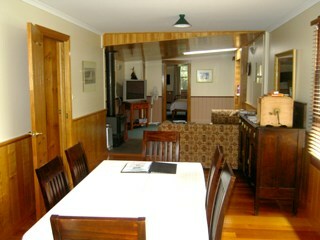 It also has a private bathroom, a full sized kitchen and a dining/lounge area with warm wood fire. A verandah is also provided with lovely views to the garden. Rate shown is for 1 or 2 persosn, room only. Select 2 nights stay and see our great discount rate) We also offer great breakfasts and sumptuous dinners from our extensive menus featuring our own local seasonal vegetables and fruit. This lovely suite includes a bedroom with queen bed, ensuite bathroom, its own entrance and lounge/dining room. It has a kettle, toaster and microwave. 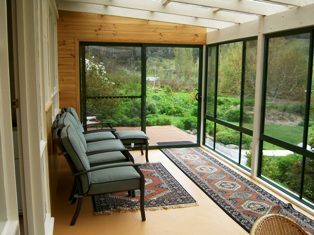 A verandah is also provided with views to the garden. Why not take a walk along our 1 kilometre walking track to our ponds whre you may see some local wildlife. Rate shown is for 2 persons with full breakfasts (cereal, home made bread, jams, juice, fruit and cooked items). A lovely sunny room with its own entrance, King sized bed (or 2 singles-please specify in the Requests area if you require single beds)and an ensuite bathroom with 3/4 bath. Want views? How about your own sunroom/dining area exclusive to this unit with great vistas to our ponds and gardens. It also has a kitchenette with hotplates, small pizza/grill/baking oven, a microwave, toaster and kettle. Essential cooking utensils, linen and crockery/cutlery are provided. Why cook when we also offer a sumptuous and extensive dinner menu with dishes for all tastes featuring our own seasonal vegetables and fruit. Rate shown is for 2 adults and 2 children, room only. A lovely sunny room with its own entrance, King sized bed (or 2 singles - please specify in the Requests area if you require single beds))and an ensuite bathroom with 3/4 bath. A foldout sofa bed is also provided for the 2 extra persons. A sunroom/dining area exclusive to this room is also included with great views to the ponds and gardens. It also has a kitchenette with hotplates, small pizza/grill/baking oven, a microwave, toaster and kettle. Essential cooking utensils and crockery/cutlery provided. We also offer great breakfasts and a sumptuous dinner menu at extra cost. Rate shown is for 2 persons with continental breakfasts (cereal, home made bread, jams, juice, fruit). 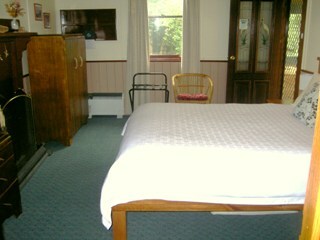 This lovely roomy facility has 2 bedrooms: 1 room with Queen bed and 1 room with 2 single beds. It also has a private bathroom, a full sized kitchen and a dining/lounge area with wood fire and electric heating. A verandah is also provided with lovely views to the garden. Rate shown is for 2 persons enjoying a 2 course dinner (main course plus entree or dessert) from our extensive a la carte menu, and full breakfasts incl. cooked items. Please order dinner on arrival. The King bedroom is a lovely sunny room with its own entrance, King sized bed (or 2 singles-please specify in the Requests area if you require single beds)and an ensuite bathroom with 3/4 bath. A sunroom/dining area exclusive to this room is also included with great views to the ponds and gardens. 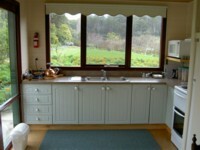 It also has a kitchenette with all the essential cooking utensils and crockery/cutlery are provided. Rate shown is for 2 adults and a child, room only. Children are 4 to 14 years old inclusive. A lovely sunny room with its own entrance, King sized bed (or 2 singles-please specify in the Requests area if you require single beds)and an ensuite bathroom with 3/4 bath. A foldout sofa bed is also provided for extra person. A separate sunroom/dining area exclusive to this room is also included with great views to the ponds and gardens. It also has a kitchenette with hotplates, small pizza/grill/baking oven, a microwave, toaster and kettle. Essential cooking utensils and crockery/cutlery provided We also offer great breakfasts and a sumptuous dinner menu. Rate shown is for 2 persons with continental breakfasts (cereal, home made bread, jams, juice, fruit). 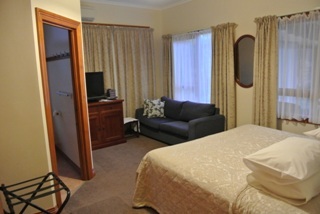 This lovely suite includes a bedroom with queen bed, ensuite bathroom, its own entrance and separate lounge/dining room. It has a kettle, toaster, bar fridge and microwave. Why cook when we also offer a sumptuous and extensive dinner menu with dishes for all tastes featuring our own seasonal vegetables and fruit. Rate shown is for 2 persons with full breakfasts (cereal, home made bread, jams, juice, fruit and cooked items). We also offer sumptuous dinners from our extensive menus featuring our own local seasonal vegetables and fruit. This lovely suite includes a bedroom with queen bed, ensuite bathroom, its own entrance and lounge/dining room. It has a kettle, toaster and microwave. Rate shown is for 2 persons with continental breakfasts (cereal, home made bread, jams, juice and fruit). A lovely sunny room with its own entrance, King sized bed (or 2 singles-please specify in the Requests area if you require single beds)and an ensuite bathroom with 3/4 bath. Want views? How about your own sunroom/dining area exclusive to this unit with great vistas to our ponds and gardens. It also has a kitchenette with hotplates, small pizza/grill/baking oven, a microwave, toaster and kettle. Essential cooking utensils, linen and crockery/cutlery are provided. Why cook when we also offer a sumptuous and extensive dinner menu with dishes for all tastes featuring our own seasonal vegetables and fruit. Rate shown is for 2 persons with full breakfasts (cereal, home made bread, jams, juice, fruit and cooked item). 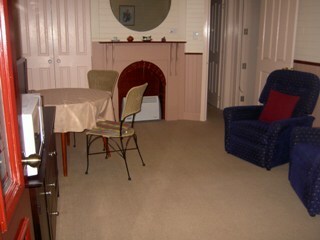 This lovely roomy facility has 2 bedrooms: 1 room with Queen bed and 1 room with 2 single beds. It also has a private bathroom, a full sized kitchen and a dining/lounge area with wood fire and electric heating. A verandah is also provided with lovely views to the garden. Rate shown is for 2 persons enjoying a 2 course dinner (main course plus entree or dessert) from our extensive a la carte menu, and full breakfasts incl. cooked items. Please order dinner on arrival. This lovely suite includes a bedroom with queen bed, ensuite bathroom, its own entrance and lounge/dining room. A verandah looks onto the gardens. It has a kettle, microwave oven and toaster.